It was a year filled with unpredictable circumstances -that for many of us- were great opportunities to reach out through love and contribution. This year has taught me much about the nature of impermanence -in a world of unpredictable natural disasters & political madness- but it has also allowed me to look deeper within and reach a level of greater love for everyone, where there is not time to embrace our egos, but run to each other’s arms in the spirit of collaboration and contribution to one another. On a personal level, Love surprised me in the most magnificent of ways, finding care, kindness and true love at the core of my experiences. I got married to the kindest of souls in Malibu,fell in Love with Paris and Ying Yoga and a few incredible creative masters and books. I became a fan of everyday warriors speaking for the voiceless and learned more about self-love and doing more of what truly makes me happy. It was a beautiful year to be a WOMAN witnessing a majestic renaissance in our lives and our voices. Women from all different cultures and backgrounds came out filled with courage to share their experiences of abuse and harassment, bringing awareness to the many atrocities that have been affecting us for many moons. It was a year for womanhood to share its common bridges of compassion and unity. 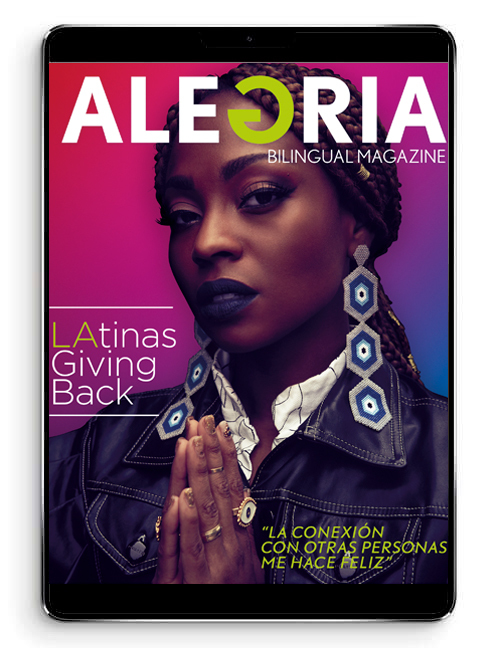 Our covergirl,Karol G is a living testament to a new wave of young and determined young women ready to follow their dreams with actions and unwavering faith because they are #Unstoppable. Dreamers like Maribel Serrano filled with courage shared their stories of hope and uncertainty to bring more awareness to all the work that is yet to be done in our world. A world that leaves us pensive but that encourages us -more than ever- to stay in the present and live our ALEGRIA as much as possible from within and open our hearts to empathy and compassion, living spiritually centered lives geared towards global well-being and social justice. A world where our moments of ALEGRIA with those we love are at the core of our priorities, a world where living our dreams with urgency and care matters the most, a world where contribution and collaboration are the only real answer. Local artists and content creators gave a new aura to 2017 defying a mass market with unique creativity, a trend that won’t go extinct in our fast paced world. A creative economy filled with curiosity for the unknown, undiscovered and untraveled territories. It was thanks to our partners and loyal friends and readers that we can still exist as an independent media company. Thank you Aventura Dance Cruise CEO Moshe Raiser for showing us a year of pure ALEGRIA and taking us through an amazing world of Latin Music and Latin dance. Thank you Skirball Cultural Center for caring about the Arts & Culture in our community year after year. Thank you to each and every entrepreneur, team member, entertainment media and PR colleagues and business owners: Eva Macias, Jose And Carlos Alfaro, Maritere and Peter Bellas, Leyna Topete, Luz lluncor & Ayled Zuluaga, Lucy & Brett at Pez Cantina, Cesar & Paola Hernandez at Cad Stone works and many others,who walked with us this new milestone and all the influencers who supported us in our mission.